Home energy systems are a long-term investment that you want to get right. Performance and reliability are most important, and Enphase excels at both. At the same time, the Intelligence that’s built into the Enphase technology offers you the flexibility to handle whatever the future might bring—from home expansions to smart home and smart grid integration. An Enphase Micro Inverter is attached to the mounting kit underneath each panel. The micro inverter uses state of the art electronics to convert DC to AC underneath each panel. This allows each individual panel to output power independently from the other panels, significantly increasing system output. It is not just shade from trees that can affect solar output. Bird droppings and dust as well as chimneys and power lines can all affect solar output. Additionally, solar panels have a +- tolerance during the manufacturing process. For example, Trina Honey 260W panels have a 0 – +3% tolerance, so they will range in output from 260W to 268W. Your system won’t be able to take advantage of this unless each panel is outputting power independently from the other panels. Using Micro Inverters allows our solar technicians to design a panel array across multiple roof areas – both across different orientations and angles. If you use most of your power in the afternoon, it can be beneficial to have panels facing both north and west to distribute the output of solar power across the day. This avoids having a big peak of solar power in the middle of the day, making it easier to use a large percentage of the solar power as it is generated, and hence increasing the value of your system. The Enphase Envoy Communications Gateway is the networking hub for the system. The Envoy Gateway connects to the internet to transfer live data on system performance and critical issues. 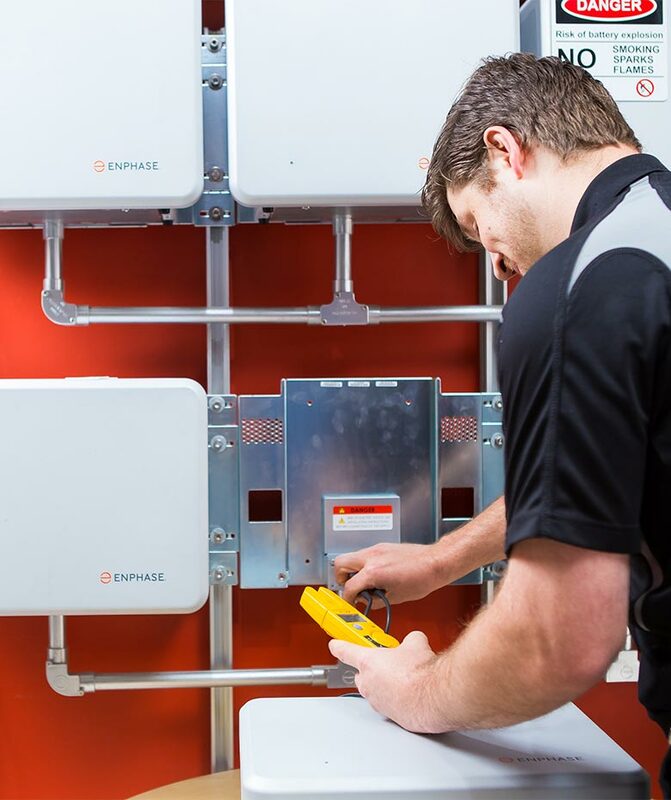 As your Enphase Installer, Excel Power receives automatic emails alerting us to any technical issues, making it simple to conduct system checks remotely from our office, or even when our technicians are on the road. Customers are also able to read system output and check the system status on the Envoy’s LED screen. The Enlighten software platform provides solar professionals and solar system owners with ongoing system statistics and uptime assurance. Enlighten has a user friendly and engaging interface to view your energy production. This energy monitoring platform is regarded as one of the best in the industry. Micro Inverter systems avoid the need for high voltage DC cable runs, increasing safety for the home owner. If a string inverter system was invented today it would probably be deemed illegal due to the need for a high voltage cable run through your home. There is also power leakage on longer DC cable runs, making safe and easy AC cable runs the preferred option whenever possible. In the unlikely event that something goes wrong with one of the panels or micro inverters, the rest of the system that is unaffected will still be operational. This allows for less down time, and allows you to continue to generate solar power during a warranty claim or service check. Both Enphase and Excel Power as your installer have access to live, real time monitoring of every panel. In the event of a fault, Excel Power receives an automated message to alert us to the issue. In most cases, the firmware can be updated by Enphase technicians and the problem fixed remotely. This can save you days of downtime and the frustration of having to call out a technician. Micro inverter systems are expandable, limited only to your roof space. Excel Power can install as many additional panels as you like, and we don’t need to match the panels to your existing array. This allows you to take advantage of any technology gains over the next few years. For example, you may find that in 3 years time, 300W panels are the market standard. With a standard string inverter system, we would normally use a single phase inverter even if you have three phase power. We connect the inverter to the phase that uses the most power. The alternative is to use an expensive three phase inverter. For systems over 5kWs you must have three phase power and so the only option is to use a three phase inverter. With an Enphase Micro Inverter system, there is no additional cost for you if you have three phase power. This is the best option from a technical viewpoint, and can save you a lot of money as you don’t need to upgrade to a three phase solution. Enphase offer a 10 year warranty as standard. It is a full replacement warranty so you are not out of pocket in the event of a failure. One of the reasons Excel Power are considered to have industry leading support standards is that we offer full replacement warranties. Excel Power do not have ‘back to base warranties’ where you need to send faulty parts to the manufacture. All of the main string inverter manufacturers including SMA, ABB (Aurora), Schneider Electric and Growatt offer a 5 year warranty as standard. In some cases, these warranties can be extended to 10 or 15 years. Enphase systems are battery ready and are the preferred option if you are considering batteries in the near future. The Enphase Energy Management System is unlike anything else currently available because of its compatibility. 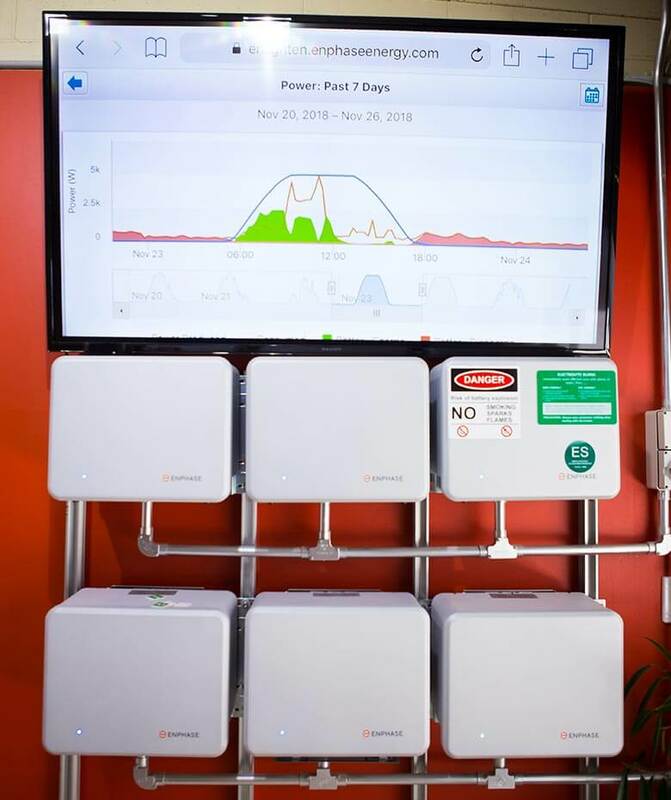 Enphase Batteries are connected directly to the meter board, where we install a control hub that manages power consumption and storage in the home. This allows the Enphase power storage system to be compatible with any existing solar system. This is in stark contrast to other battery systems that typically connect directly to an expensive hybrid solar inverter and have limited compatibility. The system itself has been designed to be modular, expandable, easily installed and can be tailored to each customer’s usage profile. A household or business will be able to monitor their usage, solar generation and peak times, and install more battery capacity knowing that it will pay for itself in the quickest possible time. A grid profile is a collection of frequency and voltage settings that defines acceptable operating parameters for Enphase microinverters. Applying a grid profile ensures compliance and interoperability with the local electric utility, such as Ergon and Energex. Microinverters reference the grid profile to determine if the electric grid is operating outside the normal range. These settings can easily be changed, if required by the utility, by the installer simply logging in the Enlighten Manager. No need for any other pieces of equipment.